Andy found his forever home with Gretchen Beckert, Steven Trainoff and their beautiful Borzoi-Border Collie mix Molly in the waning days of 2003. He is living the life of a King with time spent loafing on a comfy bed, going to daycare and being Gretchen’s shadow. He has resigned himself to being pampered at his in-home spa; where a brushing of the teeth, trimming of the nails (which he sleeps through) and a polishing of the coat regularly interrupt nap time. 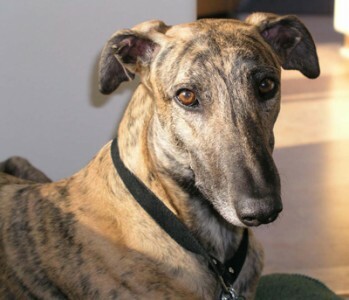 Don’t get us wrong, this dashing specimen of a Greyhound is no slouch. His communication skills are in order. After being asked to “sit” too long before a meal he rolled his eyes and sighed at his rather dense person, then regally walked back to his bed. Translation—”When breakfast is really ready just ring for me. I refuse to interrupt my morning snooze to do anything as undignified as a sit. Just remember who is the King around here”.